Over the last year or so I started to really appreciate the virtues of dresses compared to skirts and separates. Dresses make getting dressed in the morning as easy as 1, 2, 3. The only thing you have to worry about is selecting the right accessories. So, when this Basketweave print dress rolled out a couple months ago as a new arrival at the J. Crew Factory, I knew it had to be mine. 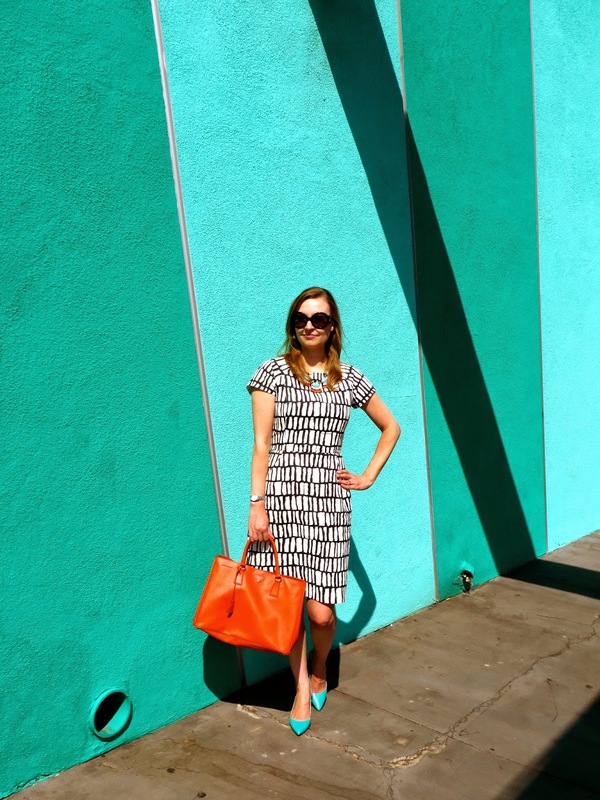 It has everything I look for in a dress: a great graphic print, a longer length that is appropriate for work, and substantial, quality material. This dress definitely has a luxurious feel despite the relatively low factory outlet price. A dress like this makes getting dressed in the morning a cinch so that you can avoid being a basket case and just focus on the lovely basketweave print instead! what a great dress!! and loved how you styled it! this might be joining my closet soon. Cute dress and I love the orange Prada bag mixed with the turq pumps, great look! Could not agree more! I don't wear nearly enough dresses. 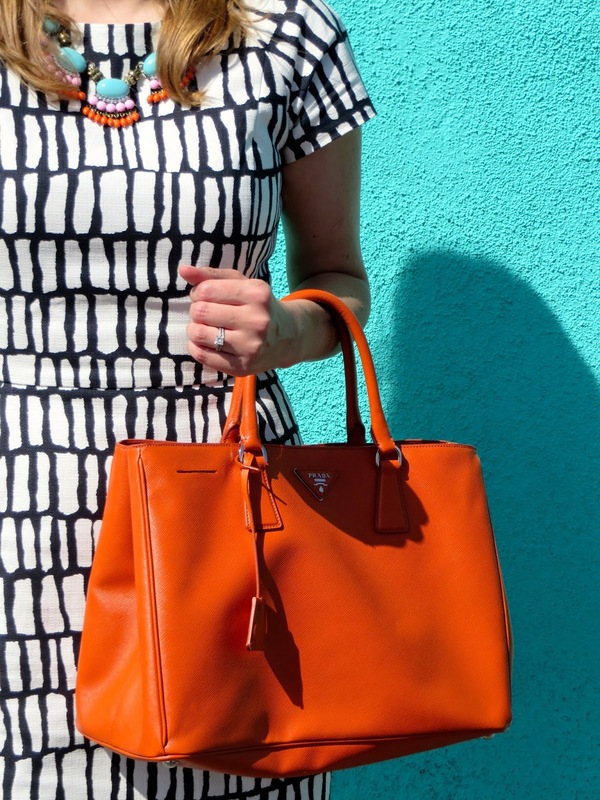 Love the print on this one and the perfectly coordinated accessories you added! Great colors and styling. 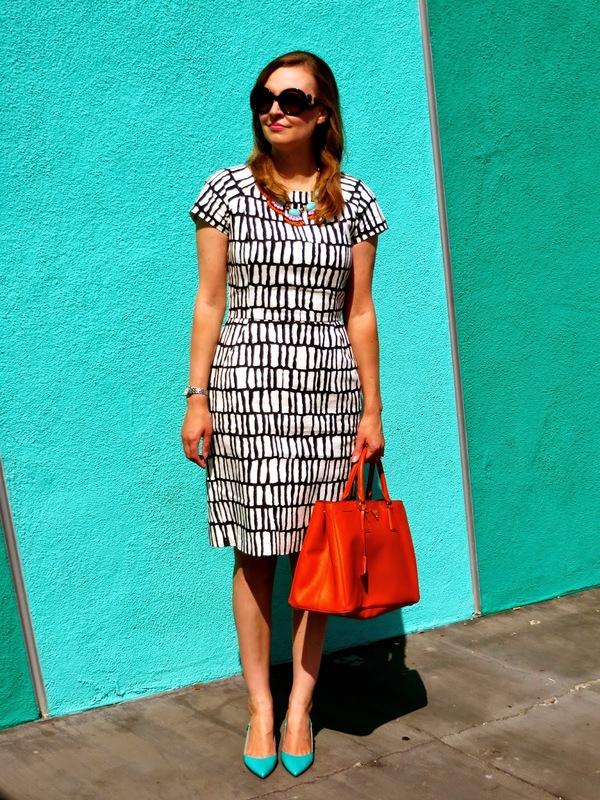 Thanks for linking up to Work Style Wednesday! Love this dress! Dresses really do make getting dressed easy! LOVE the choice in accessories!!! PERFECT pop to the dress!! This dress is gorgeous, and I love how you paired it with orange! Stunning! In love with that dress and don\t you loe that feather J.Crew Necklace? I have it also but in different colors. You have stunning bags - all in gorgeous colors! Ahhhh so you are a bag girl too I see. Love love the color and the dress is stunning on you.